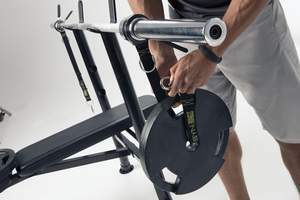 LOS ANGELES, CA--(Marketwired - Jan 21, 2014) - MostFit™, the creator of the popular MostFit™ Suspension Strap, announced today the release of the innovative, new stability weight training apparatus, MostFit™ SYN Rings. MostFit™ SYN Rings allow the user to suspend weight plates from an Olympic weightlifting bar in order to create instability -- forcing the user to engage more core and stability muscles, and increase overall strength. An easy-to-use solution, MostFit™ SYN Rings are available for an MSRP of $39.95, and are available for purchase at www.most-fit.com. Extremely versatile, MostFit™ SYN Rings can be used for everything from bench presses, overhead squats, step-ups and lunges, to Turkish get-ups, bicep curls and skull crushers. Upon suspension, the weight plates are able to move in all directions, including forward, back, side-to-side, up-and-down, and in circular motions. Stability weight training with MostFit™ SYN Rings promotes core stabilization, explosive muscle engagement, and athletic development, helping people to improve their overall fitness and be the most fit they can be. MostFit™ SYN Rings will make their debut at The Fit Expo (www.thefitexpo.com/la.asp), Southern California's premier fitness event, at the Los Angeles Convention Center on January 25-26, 2014, alongside the comprehensive fitness line's family of products, including the MostFit™ Suspension Strap, the MostFit™ Resistance Tube, the MostFit™ Resistance Band, the MostFit™ Resistance Loop, and the MostFit™ Exercise Mat. Visit MostFit™ and see the SYN Rings for yourself at Booth 200-202. Add a new type of intensity to your workout today with the MostFit™ SYN Rings! MostFit™ strives to provide unique, effective, efficient, and affordable fitness products to help you be the MostFit™ You Can Be. Our line of fitness products features something for everyone, from busy executives and busy parents, to veteran weightlifters, personal trainers, and Yogis... and even not-so-busy executives. We know you're out there! We've made you do Burpees before! Fitness is for everyone and it belongs to you. To request product images, review product or interviews with MostFit™ creator Andrew Gavigan, please contact JSPubRelations@gmail.com. Add a new type of intensity to your workout with MostFit SYN Rings! Add a new type of intensity to your workout today with the MostFit SYN Rings -- available for purchase at Most-Fit.com!